"This is a terrific opportunity to showcase excellent contemporary art in Frederick," said FAC Executive Director Louise Kennelly. The National Endowment for the Arts is awarding the Frederick Arts Council a $10,000 grant to support a pop-up gallery at 11 West Patrick Street, which will house a site-specific installation by a regional artist for a full year. The award will fund the exhibit’s creation, while the gallery space is provided in kind by the Ausherman Family Foundation. "This is a terrific opportunity to showcase excellent contemporary art in Frederick, said FAC Executive Director Louise Kennelly. "This is the third NEA grant for the Frederick Arts Council in four years, and we are pleased to be selected again for our strong track record in advancing high-quality arts and arts opportunities in Frederick. These are very competitive national awards and we are pleased to provide programming that is considered exemplary on a national level," Kennelly added. Artist selection will take place by the end of October and the installation will be open to the public by December 1st. The Frederick Arts Council invests in a vibrant and cohesive arts community for the people of Frederick County. The organization fosters an environment where the arts flourish in the community through grants and scholarships, arts advocacy, and links to essential resources. FAC is responsible for large-scale programming such as the Frederick Festival of the Arts, Art in the Park, and Frederick County’s Arts in Education grants. 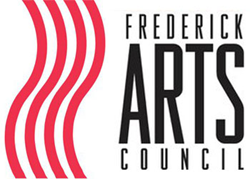 For more information about the Frederick Arts Council, visit http://www.frederickartscouncil.org.